The Berlin Wall was a wall in Berlin, Germany that separated Communist East Berlin from democratic West Berlin. The Wall was erected overnight on August 13-14, 1961. 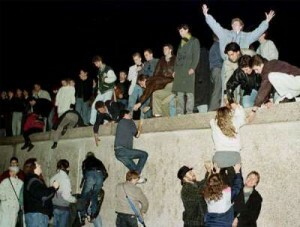 Over the 28 years that the wall was in place, East Germany jailed more than 75,000 people who tried to flee to the West across the Wall, and 809 people died/were killed in escape attempts.